Amino acids in the diet Why are they important? Amino acids occupy a top position on the scale of substances that are essential for life on our planet. Without them there could be no life, not even the tiniest bacteria. Their cytoplasm contains protein, and also there would be no virus, having a coat protein. This amazing substance is rarely found in nature in the free state. It is usually linked to large protein molecules and related peptides, also important for vital functions. There are more than 500 amino-acids, proteins, but in the composition it is included a total of twenty. From that, the human body can produce eleven, while the rest are so-called essential amino acids. They must be taken in with food. Certain foods are a good source of some of the nine substances, so be sure to consume them. Such foods are composed of valuable proteins or peptides that are very important to us. 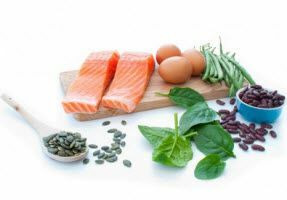 Hereinafter, find out why amino acids are important in the food, and what you need to know about them. What is the role of proteins in the human body? Proteins are essential elements for growth, regeneration, functioning and structure of all living cells. Digestion disintegrates the basic unit - amino acids, which are then re-combined into proteins. They are necessary for the formation of enzymes and hormones. Also, for the functioning of muscles, bones and other tissues and systems in the body. In order to make the correct protein synthesis, all amino acids must be present simultaneously. It is very important that the proper relation to each other is spaced evenly and is in sufficient quantity represented. If you miss just one of them, the production of proteins for which the synthesis of the amino acids is necessary slows down or stops. Where we find proteins in food? Foods rich in protein can be from animal or vegetable origin. The first group consists of meat, chicken, fish, eggs, milk and milk products. While the best sources of vegetable protein are grains, legumes, nuts and seeds. No plant foods contains all the essential amino acids (such food is called a complete protein). However, the proper combination of foods can meet the needs of these important substances. Thanks to them, the body will also be supplied with useful nutrients. Rich in vitamins, minerals, fibre and other phytonutrients that contribute to the preservation of health. This does not mean total rejection of meat from the diet, which is the main disadvantage of a high content of saturated fat. Experts say that it is very important to balance the intake of vegetable and animal origin. The advantage is in fruits, vegetables, nuts, fish and chicken. Otherwise, the most complete protein food is breast milk. What are BCAA amino acids? Branched chain amino acids (BCAA - branched-chain amino acids) include isoleucine, leucine and valine. Research has shown that they play an important role in regulating blood sugar levels. They protect the body from free radicals, slowing down aging and improve the general condition of the people in the third age period. More below. Unlike proteins, whose excess in the body is transformed into fat, supplies of essential amino acids cannot be converted like that. These valuable substances have to constantly be brought in by food. These are the most important ones. It stimulates growth and increase muscle mass, helps regulate blood sugar. Acting on neurotransmitters in the brain - it prevents and relieves depression. There are an excellent vegetable sources of these essential amino acids. It can be found in algae, peas, beans, soybeans, brown rice, raisins, bananas, apples, blueberries, olives, whose seeds, sesame. It is necessary for proper growth, development and regeneration of tissues and organs. It is similar to leucine and, in fact, is the isolated forms of these essential amino acids. It helps produce energy in the body and participates in the production of haemoglobin and development of muscles, especially in children. This amino-acid is rich in almonds, oats, lentils, beans, cabbage, quinoa, hemp seed, sunflower and sesame, cranberries, apples, kiwi fruit. It is very important for the proper growth and for the production of carnitine. This substance regulates fat metabolism and maintains an optimal level of cholesterol in the blood. Also, it helps the absorption of calcium, needed for bone density, and participates in the production of collagen. The lack of these essential amino acids causes osteoporosis, nausea, depression and fatigue. Lysine is found in beans (the best source! ), Lens, chickpea, soy, parsley, almonds, algae Spirulina, avocados. It belongs to the so-called tiomin amino acids, which are composed of sulphur, which is why the methionine is necessary for building of cartilage. People who do not get enough methionine often suffer from arthritis and have problems with wound healing. This essential amino acid is involved in the development of muscles and helps produce creatine. It is essential for optimal energy levels in the cells. The plants that are rich in methionine are sunflower, hemp (seed), Brazil nuts, oats, wheat, seaweed, beans, brown rice, onion, cocoa. These essential amino acids can be found in three forms - natural, synthetic or a combination of both. The body converts it to tyrosine, which stimulates brain function and maintains the health of the thyroid gland. A lack of phenylalanine causes poor appetite, lack of energy, depression, memory impairment. Larger quantities contain spirulin and other algae, berries, whole spinach and avocado. It is found in peanuts, almonds, olives, grapes, figs, leafy vegetables. Is responsible for the optimal functioning of the immune system, heart, liver, central nervous system, connective tissue and joints. It maintains the balance of proteins in the body, and also participates in the production of glycine and serine. These amino acids are essential for healthy skin, bones, hair and nails. It prevents the accumulation of fat in the liver. The best plant sources of threonine are spirulin and watercress (better even than meat). There's the green leafy vegetables, pumpkin, sunflower, wheat, raisins, sesame seeds, figs, quinoa. Also known as amino acids for relaxation, tryptophan is essential for the health of the nervous system, the functioning of neurotransmitters and good sleep. It is responsible for the production of serotonin (hormone of happiness), relieves stress and depression. High levels of tryptophan can be found in oats, bananas, oranges, apples, sweet potatoes, parsley, beans, celery, figs, mushrooms, peppers, carrots, onions. It plays an important role in the development, regeneration and endurance of muscles. BCAA also can be supplied by the diet. It can be found in the beans, spinach, broccoli, sesame seeds, blueberries, cranberries, oranges, apricots. Participates in the transport of neurotransmitters in the brain and maintains the health of muscle cells. It stimulates detoxification of the body, is responsible for the production of red and white blood cells, necessary for general health and strong immunity. Lack of histidine causes arthritis. Good plant sources of it are brown rice, wheat, rye, buckwheat, legumes, seaweed, melons, potatoes, cabbage, and corn. How important is it to enter the essential amino acids through food, you can be assured of it in the previous row. Therefore, we have prepared two exceptional recipes, it is a true protein bombs, which are very healthy. Cook onion in a little oil, when soft, add garlic and fry a little. Put curry, carrots and potatoes, pour water and cook until ingredients are tender. Add remaining ingredients and allow it to boil. Reduce heat, cover the pan and cook until lentils become soft. Season to taste, sprinkle with chopped scallions and serve with sour cream. Preheat the oven to 200 ° C. Mix the ingredients for the dry dough, and then in a special container mix those for moist dough. Mix them - you will get a thick, sticky mass. Make balls and place them in a baking pan lined with baking paper. Bake for 10 minutes and leave to cool. Amino acids in food have been very important, therefore, regularly enrich your menus with them. Without these amazing substances there could not exist any living being, which speaks about the volumes about their importance. We recommend the article foods rich in polyphenols.